Good websites get applause. Great websites get business. Don’t let your website be just another URL on the web. We can help it be a powerful marketing medium to attract prospective customers. We are among the most experienced developer from IndiaWe have separate teams for content development, design, coding, testing and online marketing.All our website UI works are handled by our senior team. We won’t leave your design at the hands of a trainee.Our experience ranges from building corporate websites to cutting-edge portals and ecommerce websites.We never use a pre-designed template for your website. 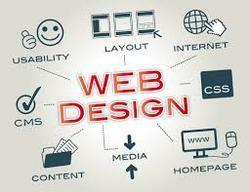 All design layouts are developed from ground up, meeting the exacting standards you demand.Our exceptional skills in search engine optimization ensures your website top ranking on search engines.